NEW YORK (January 16, 2019) – The Emmy and Peabody-nominated docu-series, “The Secret Life of Muslims,” returns this week on Wednesday, January 16th, with the first episode of its second season – a biting, comprehensive examination of the often-misunderstood term “jihad.” Using humor and empathy, the series will feature first-person profiles of Muslims across entertainment, sports, politics and more – from Hollywood’s first Hijabi film director Lena Khan (The Tiger Hunter), to Project Runway runner-up Ayana Ife and WWE professional wrestler Mustafa Ali. 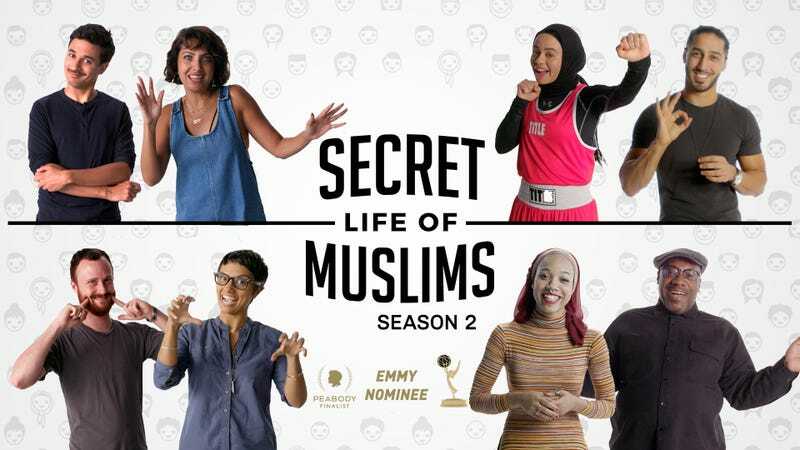 Other episodes from season two will tackle Sharia Law and Muslim-Jewish relations and feature actor/comedians Maz Jobrani (Superior Donuts), actor Iqbal Theba (Glee), actress Kathreen Khavari (Big Little Lies), and more. The 11-episode run will debut in an exclusive partnership with Gizmodo Media Group, with new episodes published each week on Gizmodo Media Group’s news and opinion site, Splinter, as well as on its Facebook channel. Season Two was executive produced by Emmy-winning filmmaker Joshua Seftel (War, Inc., Queer Eye, This American Life) and New York Times bestselling author and producer Reza Aslan (HBO’s The Leftovers., CNN’s Believer). Season One of the series, which received an Emmy nomination and was a Peabody Award Finalist, went viral after the election of Donald Trump with 38 million views to date. Series Executive Producer Joshua Seftel, who is Jewish, was inspired to create the series in part because of his personal experiences with anti-Semitism and harassment growing up in Upstate New York. “What’s happening to Muslims in our country today is something we have seen before and I felt we could do something about in some small way as filmmakers,” says Seftel. Episodes in season two were funded by the Doris Duke Charitable Foundation, Doris Duke Foundation for Islamic Art, El-Hibri Foundation, Hartley Film Foundation, Mohannad Malas, New York Community Trust, and Orange County Islamic Foundation. Righteous Persons Foundation provided additional funding for Season 2’s profile films. Watch episode one of “The Secret Life of Muslims” Season Two here on Splinter and here on Splinter’s Facebook page. For more information, visit the film’s Facebook, or website. About Joshua Seftel (Executive Producer): Seftel began his career at 22 with Lost and Found, the Emmy-nominated documentary film about Romania’s orphaned and abandoned children which led to the American adoption of thousands of Romanian children. He directed the feature film War Inc., starring John Cusack, Ben Kingsley, and Marisa Tomei, the Emmy-winning TV series Queer Eye for the Straight Guy, and is a contributor to This American Life and CBS Sunday Morning. About Reza Aslan (Executive Producer): Aslan is a best-selling author (Zealot, No god But God), commentator, professor, and producer for The Leftovers (HBO), Of Kings and Prophets (ABC), Rough Draft (Ovation), and the spiritual adventure series Believer (CNN). Aslan has appeared as an expert voice on Islam and the Middle East on NPR, Meet the Press, The Daily Show with Jon Stewart, Real Time with Bill Maher, CNN, and Fox News.